Chiropractic adjustments are very controlled, non-invasive, treatments and they are generally considered low-risk procedures, with reduced complications. Chiropractic can be considered safe when performed by a qualified, experienced professional. Side effects from the treatment are very rare, but as with any therapeutic procedure there are possible risks involved. After spinal manipulation, in some cases the patient experiences minor effects, such as local stiffness or soreness. These moderate side effects typically resolve themselves within one or two days. Common medical treatments for neck pain, back pain and headache such as over-the-counter painkillers and anti-inflammatories have risk ratios that far exceed even the highest risk estimates for chiropractic adjustments (according to scientific research). By avoiding the risks of drugs and surgery, chiropractic keeps an outstanding and enviable safety record. 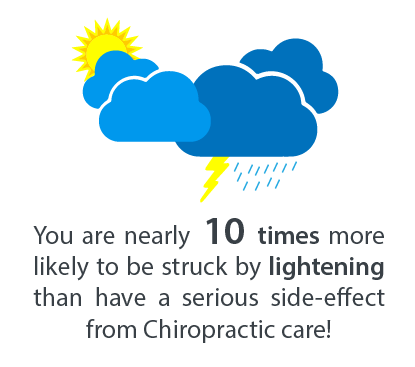 Serious complications associated with chiropractic care are overall extremely rare.